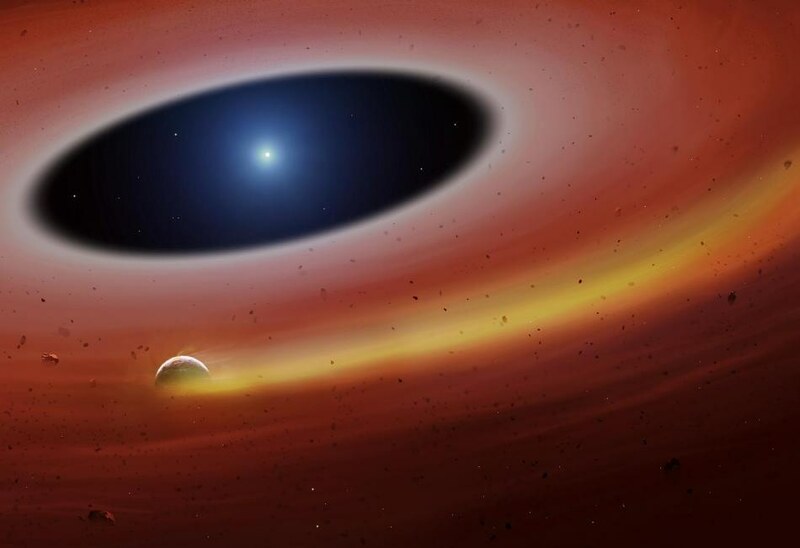 Astronomers from the University of Warwick have discovered a fragment of a planet, which endured the death of its star, in a disk of debris formed from dead planets, where the debris is eventually gobbled by the star. The planetesimal, which is rich in iron and nickel, endured a system-wide cataclysm following the death of its host star, SDSS J122859.93+104032.9. It is considered to have once been part of a larger planet, and its survival is particularly mind-blowing as it orbits closer to its star than it was earlier thought possible, revolving around it once every two hours. The discovery, which has been reported in the Science journal, is the first time that researchers have used spectroscopy to find out a solid body orbiting around a white dwarf, using slight variations in the emitted light to detect additional gas generated by the planetesimal. The researchers used the Gran Telescopio Canarias in La Palma to investigate a debris disk that orbited around a white dwarf located 410 light-years away, formed by the disorganization of rocky bodies formed of elements like magnesium, iron, oxygen, and silicon—the four important building blocks of the Earth and a majority of the rocky bodies. Inside the disk, they observed a ring of gas streaming from a solid body, similar to the tail of a comet. It is possible for this gas could to be produced by the body itself or by evaporating dust when it collides with small debris inside the disk. According to the predictions of the astronomers, the size of this body must be at least 1 km; however, its diameter could be as large as a few hundred kilometers, in comparison with the largest asteroids observed in the Solar System. White dwarfs are the remnants of stars such as the sun that have burnt the whole of their fuel and discarded their outer layers, leaving behind a dense core that gradually cools down as time passes. This specific star has dwindled in size so drastically that the planetesimal orbits within the original radius of its sun. Evidence points toward the fact that earlier, it was part of a larger body further out in its solar system and was possibly a planet ripped apart once the star began its cooling process. The star would have originally been about two solar masses, but now the white dwarf is only 70% of the mass of our Sun. It is also very small—roughly the size of the Earth—and this makes the star, and in general all white dwarfs, extremely dense. The white dwarf’s gravity is so strong—about 100,000 times that of the Earth’s—that a typical asteroid will be ripped apart by gravitational forces if it passes too close to the white dwarf. Dr Christopher Manser, Study Lead Author, Research Fellow, Department of Physics, University of Warwick. The planetesimal we have discovered is deep into the gravitational well of the white dwarf, much closer to it than we would expect to find anything still alive. That is only possible because it must be very dense and/or very likely to have internal strength that holds it together, so we propose that it is composed largely of iron and nickel. If it was pure iron it could survive where it lives now, but equally it could be a body that is rich in iron but with internal strength to hold it together, which is consistent with the planetesimal being a fairly massive fragment of a planet core. If correct, the original body was at least hundreds of kilometres in diameter because it is only at that point planets begin to differentiate—like oil on water—and have heavier elements sink to form a metallic core. Boris Gaensicke, Study Co-Author, Professor, Department of Physics, University of Warwick. The discovery provides a clue of what type of planets may dwell in other solar systems, and a peek into the future of the Solar System of which Earth is a part.